Peter Thiel, founder of PayPal in 1998 and first outside investor in Facebook and other brilliant startups through his venture capital firm, and his student Blake Masters have expanded their notes from Peter’s class in Stanford Law on what it takes to make meaningful and valuable startup companies and see them transform the world. 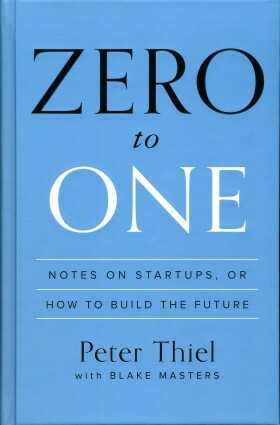 If it sounds like a big promise, Thiel’s concepts and writing are up to the task. Simply stated, Zero to One: Notes on Startups, or How to Build the Future is one of the best books I’ve ever read on what it takes to actually be creative, why one would pursue something valuable that changes the world and why many of us are more content to acquire money in lieu of something inspiring that what we might actually do with the money. After reading the book once, I went back through with my highlighter and made notes on some absolutely critical concepts that our current economy, business leaders, political environment and individuals are missing in post-recession America. Peter’s summary of secrets and the fundamental belief that in order to assume there are no secrets left to be uncovered we must also assume that all injustice has been eliminated from the world is a clarion call to all entrepreneurs to solve more problems, add more value and make a bigger future with definite plans. If you buy no other books this entire year, I implore you to buy this one and read it several times. I don’t think we’re going to cure cancer, solve nutritional and energy problems throughout the world or make the next great leap in solving the world’s injustices without every key stakeholder reading this book and taking action on its concepts. It’s that good.